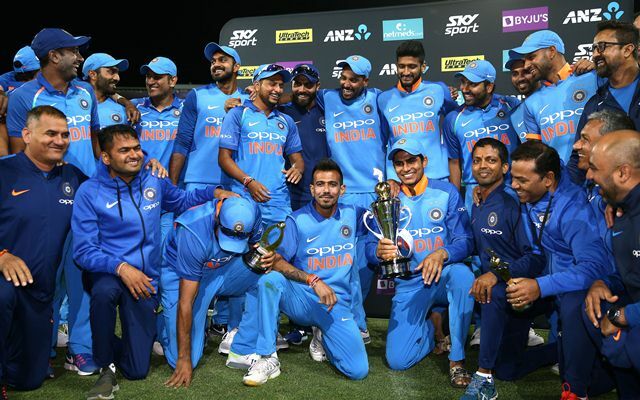 India completed a 4-1 series victory with a 35-run win at Auckland, which gives them great confidence going into the T20I series. It was yet another great game for the Maharashtra all-rounder Kedar Jadhav, who picked up Kane Williamson’s wicket with the ball and registered 34 crucial runs with the bat coming in at number 7. He also stitched a 74-run partnership with Ambati Rayudu as India came home with a 35-run win in the fifth and final ODI against New Zealand. After the presentation ceremony was done, where Ambati Rayudu won the man of the match and Mohammed Shami was named the player of the series, the entire team posed for a group picture. During this incredible moment, Kedar Jadhav kept hollering a famous dialogue from Vicky Kaushal’s box-office sensation “Uri – The Surgical strike”. As he shouted “How’s the Josh?”, the whole team responded, “High Sir!”. The moment captured a lot of attention on social media and went viral in a span of minutes. Jadhav responded to CricTracker’s coverage on this incident, who reckoned team’s performance matters way more than their individual accolades. “As they say, When you work as a team, name on the front is more important than name on the back… How’s the josh…. 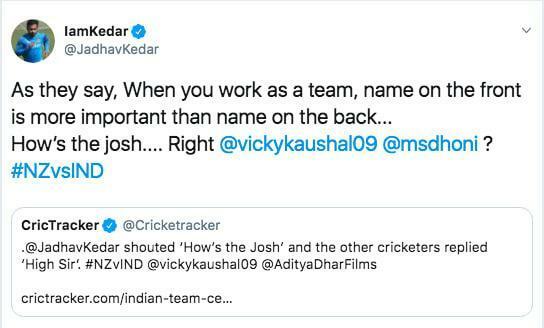 Right?” wrote Jadhav in his tweet, who also tagged Vicky Kaushal and MS Dhoni. It’s always difficult to step on the field without your main man, but the Indian contingent proved once again that they can cope with big teams without Virat Kohli. After folding up for a paltry 92 runs in the 4th ODI, they battled their way to 252 on a tricky batting surface, with Rayudu, Pandya and Vijay Shankar chipping in crucial contributions. Mohammed Shami struck early with the ball as Yuzvendra Chahal took over the mantle later to destroy the hosts. India completed a 4-1 series victory with a 35-run win in Wellington, which gives them great confidence going into the T20I series.